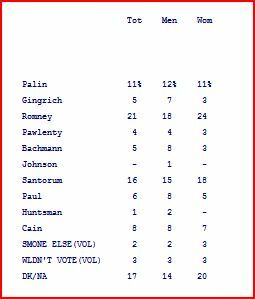 The Economist /YouGov Poll just out confirms the recent Reuters poll which had Sarah Palin ahead of Mitt Romney for the GOP nomination at 19% to 18%-this time pulling even further ahead. Above is the trending graph of potential GOP candidates from the aggregate at Real Clear Politics. The green line represents Sarah Palin’s polling movement over the past few months ( Romney is the purple line). Significant factors would be Huckabee Daniels and Barbour announcing they were not running and the commencement of Palin’s bus tour. The tour might have signalled to potential Palin supporters that she will indeed be a candidate and thus made them more certain that indication her as a preference was not a wasted indication. If we look at the actual polling results for May, or the latest available from any one firm, and compare them to those from June too date, the reason for the trend lines striking upturn is very clear-and this is without Palin having as yet made a definite commitment to running. 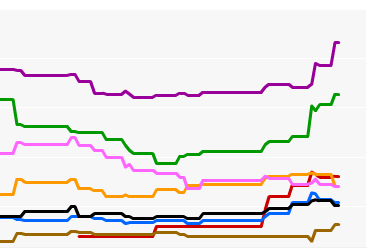 PPP Polling most recent result was in April and Reuters does not have a previous relevant Palin history on RCP. want a Christian conservative to run for president in 2012.
substantially higher than Mitt Romney's share of the vote. conservative is a more than substantial 40%. may well surprise the pundits yet again. Tens of thousands of excited Israelis and Americans, music performances, appearances by local and international celebrities, senior politicians and a live broadcast that will reach millions of viewers – this is just some of what is in store for Glenn Beck’s upcoming rally “to restore courage,” which is set to take place on August 24 in Jerusalem. The staunch Christian Fox News personality aims to show support for Israel by recreating last August’s rally “to restore honor,” which he held in Washington, DC. This year, the Wailing Wall will replace Lincoln Memorial as the backdrop for the event, which will take place at Jerusalem’s Old City and the Teddy Stadium simultaneously. The multi-million dollar production is expected to be attended by a convoy of American dignitaries, including former vice presidential candidate Sarah Palin. US Senator Joe Lieberman, a Democrat, and Republicans Mitt Romney, Newt Gingrich, Mike Huckabee and Congresswoman Michelle Bachman are to join Beck at the rally as well. The bustle of preparation has also been felt at the Knesset: the legislative body is to host a meeting between the visiting dignitaries and their Israeli colleagues. World Likud Chairman MK Danny Danon is leading the Knesset’s cooperation with Beck. The two met in the US recently. Above is the trending graph of potential GOP candidates from the aggregate at Real Clear Politics. The green line represents Sarah Palin’s polling movement over the past few months (Romney is the purple line). Significant factors would be Huckabee Daniels and Barbour announcing they were not running and the commencement of Palin’s bus tour. The tour might have signalled to potential Palin supporters that she will indeed be a candidate and thus made them more certain that indication her as a preference was not a wasted indication.